Earlier this month, the award-winning show School of Rock – The Musical celebrated its 1000th performance. The hit West End production, based on the iconic film of the same title, is now booking till January 2020. Based on the hit film, this hilarious new musical follows Dewey Finn, a failed, wannabe rock star who decides to earn a few extra bucks by posing as a substitute teacher at a prestigious prep school. There he turns a class of straight-A students into a guitar-shredding, bass-slapping, mind-blowing rock band. While teaching these pint-sized prodigies what it means to truly rock, Dewey falls for the school’s beautiful, but uptight headmistress, helping her rediscover the wild child within. Three teams of twelve kids who make up Dewey’s band with 20 adults cast. 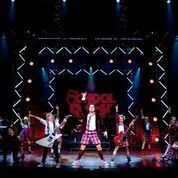 School of Rock – The Musical features music from the movie, as well as new music written by Andrew Lloyd Webber, with lyrics by Glenn Slater and a book by Julian Fellowes. School of Rock – The Musical is directed by Laurence Connor with choreography by JoAnn M. Hunter, set and costume designs by Anna Louizos, lighting design by Natasha Katz, sound design by Mick Potter, music supervision by John Rigby with Matt Smith as musical director. Continuing the search for the opportunity to ‘join the band’, if you are between 8 – 12 years old and play a rock instrument (guitar, bass, piano, and/or drums) or sing. There will be kids open auditions in Cardiff on 31 March. All children must be available for contract dates which are July 2019 – March 2020. Registration and further details can be found by contacting Jessica Ronane Casting at rock@jessicaronane.com or at www.schoolofrockthemusical.co.uk/auditions.